Any livestock operation involves messy considerations—odor, waste disposal, and potentially contaminated runoff among them. As farming operations consolidate across the country, agricultural air quality in particular has emerged as a big issue, along with the underlying issue of how to quantify hard-to-measure emissions of dust, ammonia, hydrogen sulfide, and other air-borne substances. 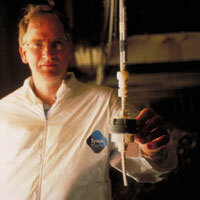 Last year, the Agricultural Air Research Council selected Al Heber (below), a Purdue agricultural engineering professor, to lead the most comprehensive agricultural air emission study ever conducted—a national $9 million effort to help the U.S. Environmental Protection Agency (EPA) establish air emissions standards for the livestock and poultry industries. Through this study, participating animal feeding operations enter into a legal agreement that protects them against potential past violations of the Clean Air Act and federal community-right-to-know legislation. Heber will be the lead researcher for the two-year air study, which begins in August 2006 as a project with Purdue’s new Center for the Environment. To conduct the study, Heber is recruiting scientists from additional universities and deploying monitoring teams with fully equipped mobile labs. They will collect data at selected farms continuously over a 24-month period on particulate matter emissions, ammonia, hydrogen sulfide, and volatile organic compounds. Outdoor manure storage facilities also will be monitored. The mobile labs are trailers outfitted with gas analyzers, pollutant detectors, weather stations, and other equipment, which record data on air samples drawn from various locations inside and outside livestock facilities. Data also will be collected on animal size and number, nutrient content of their diet and manure, climate, and routine farm operations that might affect air emissions. Mobile labs and manure storage monitoring will be established at egg, swine, dairy, and broiler chicken facilities, and separate data sets will be developed for each species. Compared with industrial emissions, says Heber, livestock air emissions are more variable, both over the course of a day and across the seasons. Agricultural emissions decrease significantly in the winter, for instance, due to lower barn airflow and the colder temperatures of outdoor waste facilities that suppress biological activity. The EPA will be able to incorporate such cyclical data into the regulations it develops.